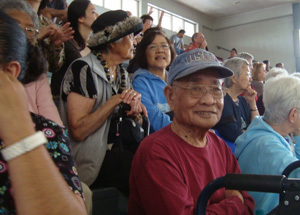 Honomu Adult Day Center is a safe, caring, mentally stimulating, and fun place for elders and challenged adults. We are located in Honomu in the Fellowship Hall of the Hilo Coast UCC. The spacious, light and airy space is easily accessible to the beautiful grounds and orchard. We are known for our afternoon strolls through the fruit trees. We also have a small raised garden bed where we harvest lettuce for lunch and flowers for our still life painting sessions. 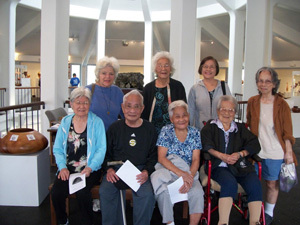 Honomu Adult Day Center is currently open on Wednesday and Friday from 8am til 4pm. Qualified, caring creative staff with a one to six staff-to-participant ratio. Care plan coordination and health monitoring by staff nurse. Nutritious breakfast, lunch and snack provided daily. Quiet, comfortable rest areas for relaxing. Support and education for family caregivers. Grant tuition assistance, for low income. Referral of clients with other needs to a variety of health and information resources. Free visitation for those interested in the program. Please come by for a visit but do phone first, we may be on an excursion to Kohala for a hay ride, Hilo for an art show, Laupahoehoe Point for lunch or just out for a scenic drive. To request an Admission Packet, please click here.